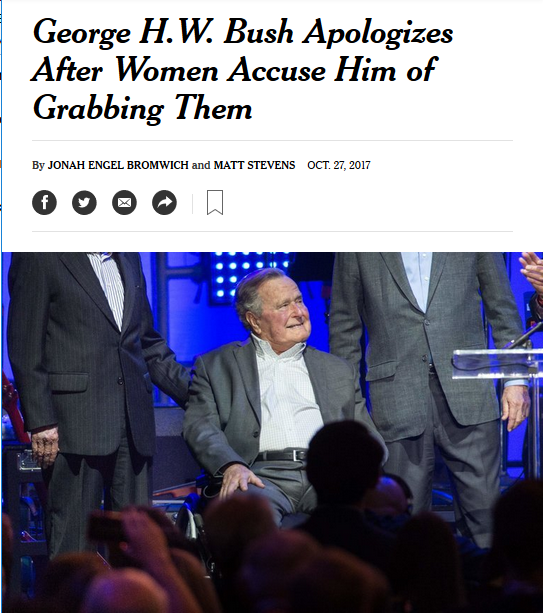 A New York Times headline (10/27/17) desexualizes the complaints made against George H.W. Bush. In the flurry of career-ending sexual assault claims coming out of Hollywood, it may seem natural for the media to overlook a little awkward groping from an aging former president. But there’s something unnerving about the assumptions surrounding the non-coverage of the Bush Sr. “Cop-a-Feel” story. On their own, the facts are simple enough. Five women have accused President George H.W. Bush of grabbing their behinds and making lewd jokes during staged photo ops over the past few years. In each woman’s account, the former president said something along the lines of, “Do you know who my favorite magician is? David Cop-a-Feel!” while squeezing their rear ends in a sexual way. The media dutifully reported this canned response, and most outlets took it at face value. None noted that when the press release uses the term “people,” it’s not actually referring to all people. It’s referring to women. But the victims are women, and many stories have searched for ways to explain away the former president’s behavior. Mr. Bush is the oldest living president and has a relatively rare form of Parkinson’s disease called vascular Parkinsonism, a disease in which a stroke or series of strokes damage nerve cells in the brain. Generally, the disease can lead to abnormal and out-of-character behavior, as well as depression or memory problems. This otherwise unattributed generalization links to a USA Today article (“Medical Condition May Factor Into George H.W. Bush’s Recent Lapses,” 10/26/17) that quotes a (male) professor of neurology from the University of Cincinnati: “Any damage to the frontal lobes, the part of the brain right behind the forehead, can cause personality changes, executive function problems and a loss of self-control,” Dr. Alberto Espay, who does not treat the former president, told USA Today. CNN (10/28/17) similarly positioned the controversy as a debate between those who see Bush’s actions as sexual assault and those who think they’re the “good-natured” jokes of an infirm old man. Dr. Daniel Amen, a (male) neuroscience and brain-imaging expert, who does not treat the former president, shared his thoughts on the potential side effects of vascular Parkinsonism. “It can also affect the front part of your brain—things like judgment, forethought, impulse control and people who have never acted badly or inappropriately their whole life, all of the sudden they start to do things that are out of character,” he told CNN. But if these are just the ill-advised outbreaks of an infirm old man, why is this the specific way his judgment falters? And why doesn’t his staff and family take steps to curb this behavior? The other women posing for the photo laughed uncomfortably, Grolnick said, while Barbara Bush made a remark along the lines of “He’s going to get himself put into jail!” Grolnick, who posted a photo of the moment on her Instagram account, said she had been warned by other actors not to stand next to Bush. The piece also recounts how “a friend of the Bush family” asked novelist Christina Baker Kline to be “discreet” after President Bush Sr. groped her in 2014. In this way, it touched briefly on the real issue at hand—which isn’t the former president’s morals or his mental state. The real story is about everyone else in the picture. The fact that when the elder President Bush sexually grabs women, people laugh but then warn women away is why his behavior continues. And lukewarm, almost begrudging media coverage is not helping the situation. It tells women everywhere that being groped, even by a former world leader, is barely news. I think in order for us to have progress and for women to reach the true equality we deserve to have, we need to stop making excuses and letting that be OK.